Little more than a decade ago Gladys Walton, then one of the most brillian stars in Hollywood’s firmament, forsook her career at the peak of her fame for a home, a husband and children. Today the mistress of a happy, normal American household in Evanston, Ill., where had lived unobtrusively for the past eight years, Gladys Walton Herbel, wife of the manager of the Universal Film Exchange in Chicago, looks back at her early decision without the slightest regret. She has exactly what she wanted – three handsome children; two boys, and a girl who aspires to be, like her mother, a great lady of the films. At 20, Gladys Walton knew what she wanted. And this is remarkable, for any one of the 1,000s of fans who then followed her would tell yo that Gladys Walton had about everything a girl of 20 could want. The future of her glamourous career seemed unlimited. But she wanted more. So she quit. Abruptly she retreated from all the glory and retired to the security of her home. Gladys Walton started her film career at 15. A high school girl in Portland, Ore., she went to Hollywood to visit an uncle. For the fun of it she visited a studio and took a “screen test.” A director who saw the results snapped her up for a part in a bathing girl picture. From them on her fame was assured. Universal Pictures engaged her for “Pink Tights” and a five-year contract followed. 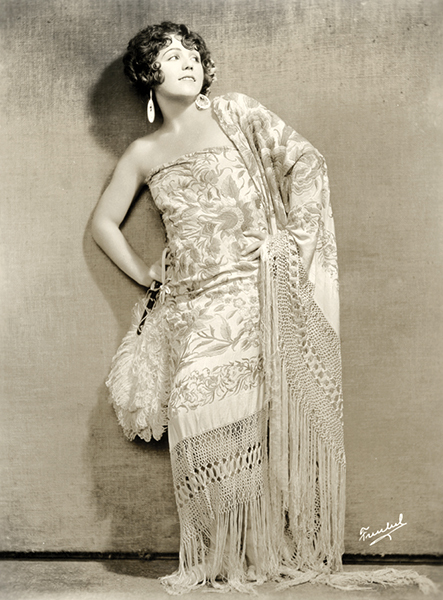 In this country and throughout the world she is remembered as the then brand new screen personality, the “flapper type,” who starred in “The Man Tamer,” “Sawdust,” “Playing with Fire” and scores of other films. During a personal appearance engagement in Portland she met Henry Herbel, West Coast district manager for Universal Pictures. They fell promptly in love and a year later were married. The day she walked to the altar Gladys Walton gave up the movies. The years that have followed have been full years. Today Mrs. Herbel is kept happily busy with her children, Mary Jane, 10; Fred 8, and Jack, 5. With her husband she golfs and swims in season and whatever spare time remains she devotes to art study and painting. The walls of her home are adorned with her handiwork, and it comprises mostly the kind of pictures the children want her to paint. Prominent is a large portrait of an Indian brave painted at the request of son Fred. The tranquility of the Herbel home is seldom ruffled, save when, as recently, Mrs. Herbel‘s name is confused with that of Gladys Walton Parliman, a New York actress whose marital troubles have been in print. “Not a regret in the world. My married life is completely happy – and that is a great good fortune. If I had continued on in Hollywood – who knows that our marriage would not have turned out like many Hollywood marriages.